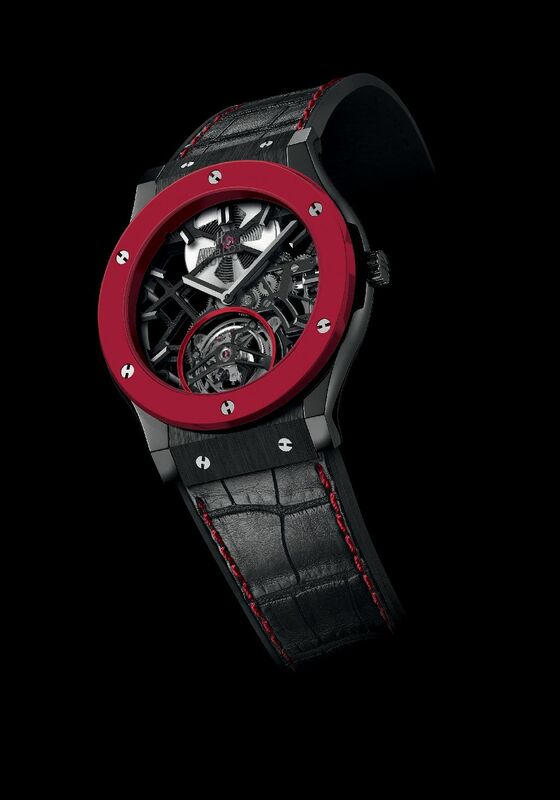 Swiss luxury watch brand HUBLOT has announced Red’n’Black Skeleton Tourbillon, a world premier bright red coloured ceramic timepiece for Only Watch 2013 – Patent Pending and this Unique piece is dedicated for charity. This is a watch that embodies the full innovative capacity of the Hublot Manufacture. After developing the Magic Gold, the first scratch resistant 18K gold in history, Hublot has succeeded in creating a brightly coloured ceramic. Bright red is the colour inaugurating this new process, in tribute to the red of Monaco for the 5th edition of the Only Watch auctions, to be held in Monaco on 28 September 2013. This bright red ceramic was the subject of months of research within the R&D Department and the Hublot foundry in Switzerland. This is the first time that the “magic formula” to achieve a brightly coloured ceramic has been found. For the occasion and for its World debut, it is the bezel that has been wrought from this new material. It is fitted on a Classic Fusion 45 mm in diameter with a finer, more classic profile, but with a black design in line with Hublot’s codes. The polished and satin-finished black ceramic case houses a fully skeleton-worked tourbillon movement with an assertively elegant and contemporary design. It features a 5-day power reserve, and was developed and manufactured entirely by the Hublot Manufacture watchmakers. And in a little nod to the new red ceramic, the tourbillon has been enhanced on the sapphire dial by a little anodised red aluminium ring, while the black alligator strap has been stitched with red thread onto black rubber, making it as flexible as ever and a pleasure to wear. Finally, this unique piece is a fine demonstration of the principle of fusion between tradition and modernity, between craftsmanship and 21st Century innovation.